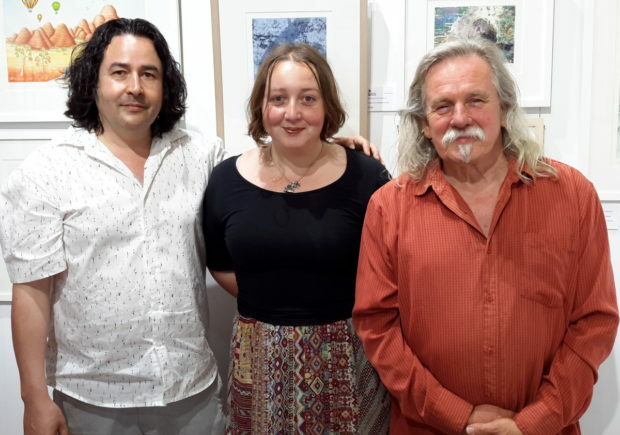 The ‘new music’ concert at Creative Space Gallery in Nth Curl Curl on Sunday November 19, 2017 was that delightful rarity – a standing room only event! Richard Rourke – clarinet, Huy-Nguyen Bui – violin, Paul Ghica – cello and Kevin Man – percussion were brilliant performing new works Interpolatus by Andrian Pertout, SIGIS by Ergis Spahiu, (for Richard) by Alan Holley as well as Tambourin and Snow by Felicity Wilcox and ….A…. by the leading Albanian composer Dorian Çene. As well, Richard performed the sublime Abime des oiseaux from Quartet for the End of Time by Oliver Messiaen and Paul was stunning in the Sonata for solo cello by Gyorgy Ligeti. Now onto our next concert in the same venue with works by Melbourne composers Eve Duncan and Haydn Reeder, as well as Richard Meale, Christopher Perrin and Alan Holley. Performers are Lucy Warren (violin), Eleanor Betts (cello), Melissa Coleman (flute) and Harriet Channon (trumpet) on Saturday December 9, 2017 at 5.30pm 105 Abbott Rd, Nth Curl Curl.